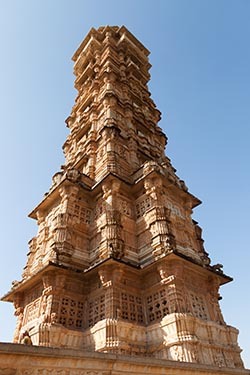 Chittorgarh is the epitome of Chattari Rajput (an Indian Warrior caste) pride, romance and spirit, for people of Chittor always chose death before surrendering against anyone. It reverberates with history of heroism and sacrifice that is evident from the tales still sung by the bards of Rajasthan. Though it can now be called a ruined citadel there is much more to this huge fort. It is a symbol of all that was brave, true and noble in the glorious Rajput tradition. 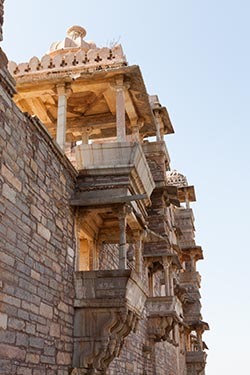 Whilst in Udaipur, we kept aside a day to visit the Chittorgarh. Chittor is about 110 kms from Udaipur and it takes about 3 hours to reach the ramparts of the Chittor Fort (Garh) that overlooks the town below. We were at the fort gates at 11AM. There’s a nominal fee to enter the fort. It’s a good idea to engage a guide and should cost you about Rs 200. By doing so, you can easily move around in the car and make stops at important sites. You would need about 2 hours for a whirlwind trip. History enthusiasts can easily spend a day. Historically, it is considered that Chittor was built by the Maurya dynasty in the 7th century AD. It was then named Chitrakut after Chitrangada Mori, a Rajput chieftain as inscribed on ancient Mewari coins. The fort is surrounded by a circular wall which has seven huge gates before one can enter inside the main fort area. 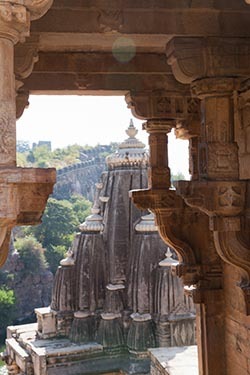 Some accounts say that the Mori dynasty was in possession of the fort when Bappa Rawal the founder of the kingdom of Mewar seized Chittorgarh and made it his capital in 734 AD. While some other accounts say Bappa Rawal received it as a part of the dowry after marriage with the last Solanki princess. After that date his descendants ruled Mewar, which stretched from Gujarat to Ajmer, until the 16th century. 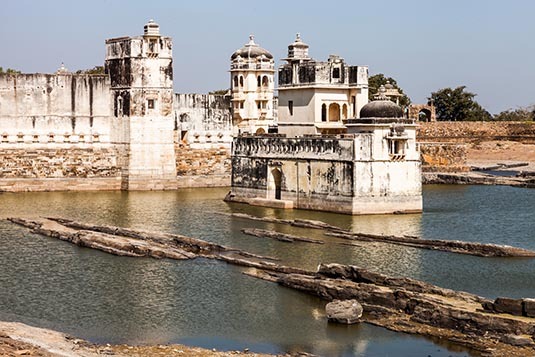 Chittor was one of the most contested seats of power in India with probably some of the most glorious battles being fought over its possession. By tradition, it remained the Mewar capital for 834 years. 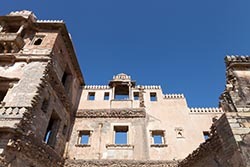 With only brief interruptions, the fort has always remained in possession of the Sisodias of the Gehlot clan of Rajputs, who descended from Bappa Rawal. The first attack was by Alauddin Khilji in 1303 AD, who was enamoured by the beauty of Padmini of which he had only heard. Rani Padmini preferred death to abduction and dishonour and committed jauhar (an act of self-immolation by leaping into a large fire) along with all the other ladies of the fort. All the men left the fort in saffron robes to fight the enemy unto death. Chittorgarh was captured in 1303 AD by Alauddin Khilji, Sultan of Delhi who led a huge army. It was recaptured in 1326 by the young Hammir Singh, a scion of the same Gehlot clan. The dynasty fathered by him came to be known by the name Sisodia after the village where he was born. Rana Kumbha (1433–68) was a versatile man – a brilliant poet and a musician. He built Mewar up to a position of assailable military strength building a chain of thirty forts that girdled the kingdom. He made Chittorgarh a dazzling cultural center whose fame spread right across Hindustan - undivided India. By the 16th century, Mewar had become the leading Rajput state. Rana Sanga of Mewar led the combined Rajput forces against the Mughal emperor Babur in 1527, but was defeated at the Battle of Khanua. Later in 1535 Bahadur Shah, the Sultan of Gujarat besieged the fort causing immense carnage. It is said that again just like in the case of Jauhar led by Padmini in 1303, all 32,000 men then living in the fort donned the saffron robes of martyrdom and rode out to face certain death in the war, and their women folk committed Jauhar led by Rani Karnawati. The ultimate sacrifice for freedom, Jauhar was again performed for the third time after the Mughal Emperor Akbar captured Chittorgarh in 1568. The capital was moved west to Udaipur, in the foothills of the Aravalli Range, where Rana Udai Singh II (the young heir apparent) had established a residence in 1559. Udaipur remained the capital of Mewar until it acceded unto the union of India in 1947, and Chittorgarh gradually lost its political importance. 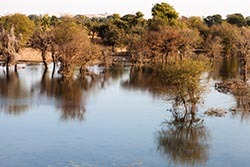 Chittorgarh is also famous for its association with two very widely known historical figures of India. First, Meera Bai the most famous female Hindu spiritual poetess whose compositions are still popular throughout North India. Her poems follow the Bhakti tradition and she is considered to be most passionate worshipper of lord Krishna. Folklore says that her love for Krishna was epitomized by her final disappearance in the temple of Krishna in Dwarka. She is believed to have entered the sanctum of the temple in a state of singing ecstasy after which the sanctum doors are believed to have closed on their own and when later opened, the sari of Mirabai was seen enwrapped around the idol of Lord Krishna, symbolizing the culmination of her union with her Lord. Second, the great Maharana Pratap, son of Rana Udai Singh II who is regarded as a personification of the values Rajputs cherish and die for. He took an oath to spend his life living in the jungles and fighting until he could realize his dream of reconquering Chittorgarh from Akbar (and thus reclaiming the glory of Mewar). It was the dream greatly cherished by Maharana Pratap, and he spent all his life to achieve this goal. He underwent hardships and a life of eating breads made of grass while fighting his lifelong battle. Maharana Pratap is the greatest hero in the eyes of the Rajputs of Mewar. In the absolute dark era of Rajput history, Maharana Pratap alone stood firmly for his honour and dignity, never compromising his honour for safety. With the reputation of a brave man with great character even among his enemies, he died free in 1597. Chittorgarh remains replete with historic associations and holds a very special place in the hearts of Rajputs, as it was a bastion of the clan at a time when every other stronghold had succumbed to invasion. It is often called as the "Bhakti Aur Shakti Ki Nagari" (land of devotion and strength). The fort at Chittorgarh also contains the ancient and beautiful temple to Goddess Kali called the Kalika Mata Temple. As the stories unfolded, I could experience goose pimples. After all, my forefathers hail from Rajasthan. Stories of velour sure churn the soul. We commenced our return journey at about 3PM. We had lunch at a dhaba (road-side eatery) and proceeded towards Udaipur, making it a point to make a few stops to picture the swaying mustard fields.